An Italian travel agent will be the guest of honor at Costa Diadema’s christening, which will take place on Nov. 7 in Genoa. 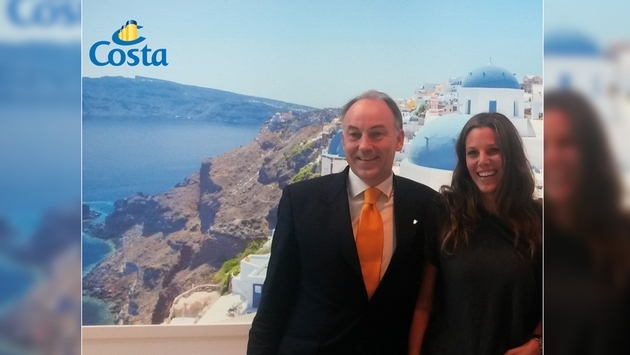 After a selection among more than 700 ladies from more than 50 different countries in the world, Carolina Miceli from Palermo has been chosen as the representative of Costa Cruises' values, according to her positive attitude and passionate work at her travel agency Tagliavia. As a travel agent she has become a true ambassador of Costa Cruises, offering the best cruise holidays to her clients. Costa Diadema's Godmother and her maids of honor will live an extraordinary experience during the night of Nov. 7, when the christening ceremony will enliven the elegant Emerald Theatre of the ship and Genoa will become the scenery of a great celebration. God, Godmother, cut!" and she will cut the ribbon allowing the bottle to break on the bow of the new flagship. After the Christening, the Godmother and her maids of honour will be also the protagonists of an elegant gala dinner onboard, sitting at the central table, as guests of honor. As "Regina del Mediterraneo", Costa Diadema will be deployed in the Mediterranean Sea. From Nov. 8 until the end of 2015 Summer season, the new flagship will leave from Savona on 7-day cruises in the western Mediterranean Sea, calling every week at Marseille, Barcelona, Palma de Mallorca, Naples and La Spezia. They will offer the chance to visit during a single cruise Florence and Naples, two of the most popular Italian cities, and beautiful Mediterranean cities like Barcelona and Marseille.